Join SBAI on Friday January 27 for lunch and the second installment of our Focus on the Future SBAI Research Seminar Series for the 2011-2012 academic year. 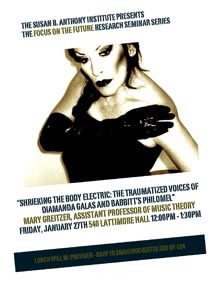 Mary Greitzer, Assistant Professor of Music Theory, will share her research titled “Shrieking the Body Electric: the Traumatized Voices of Diamanda Galas and Babbitt’s Philomel.” Greitzer says the subject matter is “electro-acoustic solo vocal performances addressing sexual violence, with themes of voice, body, trauma, madness, redemption, transfiguration, and cyborg feminism a la Donna Haraway.” We can’t wait! Greitzer’s dissertation analyzed musical embodiment in solo traumatic works ranging from Tori Amos to Milton Babbitt, applying feminist and queer perspectives to music analysis. Her related interests include performance and analysis, music theory pedagogy, avant garde, experimental and fringe art, and gender and sexuality. A lunch with vegan and gluten free options will be available, so please RSVP to sbai@rochester.edu by January 24. This entry was posted in SBAI Events and tagged #, #esm, #research, #SBAI. Bookmark the permalink.